Air Center works directly with our clients to configure the aircraft to meet their specific needs. Our Fort Worth, Texas headquarters facility maintains and operates our entire fleet. We offer fully self-sustaining airlift capabilities to our customers in some of the most remote locations on the planet. Our aircraft from the AS332C1e to the Bell 407 can be configured for NVG operations. We have recent experience in sustained expeditionary flight operations in Antarctica, South America, Middle East, Offshore ship based and coastal Alaska. Air Center Helicopters is a DoD CARB, FAA Part 133, Part 135, Part 137 and Part 145 certified rotary and fixed wing air carrier. AS332 C1e Super Puma (also known as the H215) is the newest in the distinguished Puma family. Designed to perform a wide range of missions, including passenger and cargo transport, search & rescue, medical evacuations, and external cargo operations. The AS332C1e shares the same highly acclaimed integrated advanced cockpit and automatic flight control systems found on the H225. Its excellent performance characteristics in hot and high conditions and improved range make this helicopter the ideal choice for utility missions throughout the world. The AS332L Super Puma combines power, performance and strength in a highly reliable medium-weight helicopter. This twin-engine aircraft is exceptionally smooth and stable in flight. The large cabin allows for a full range of utility configuration and up to 19 seats. The 9,920-lb payload capacity enables the AS332L to perform the most demanding logistics requirements in an airframe that has proven reliable and tough in austere locations and the harshest environments. The medium-weight, twin-engine AS330J Puma helicopter has earned a remarkable reputation as a search and rescue, medevac/casevac, and personnel and cargo transport platform through its performance and reliability. With its 7,700lb payload capacity and 400nm range, the Puma has been the workhorse of military and commercial fleets worldwide. The Bell 206B Jet Ranger is a two-bladed, single-engine helicopter equipped with the Allison 250-C20 engine. Rugged and reliable, the 206B is the most popular turbine powered helicopter ever build and has built one of the best safety records of any helicopter in the industry. With accommodations for five, including one pilot and one passenger in the front, and an internal payload of 1400lbs or sling load of 1500lbs, the Bell 206B is a great solution for light utility helicopter requirements. 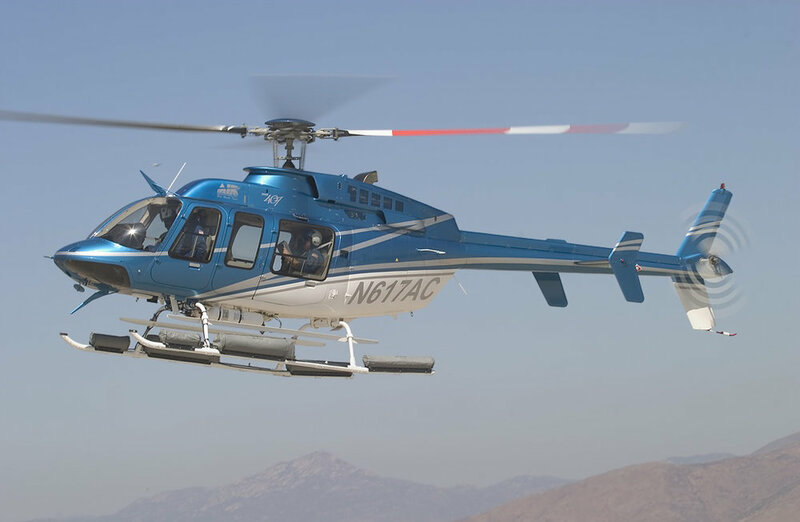 The Bell 412EP masterfully combines comfort, performance, and economy. This renowned workhorse of the industry has the reputation for getting up and going to work even in the most extreme environments. The Bell 412EP is a versatile platform suitable for missions from fire fighting, to target recovery, to search and rescue, to logistics. Our Bell 412EPs are hoist capable and cargo hook equipped. The PT6T3D engines, four bladed rotor head, and dual digital automatic flight control system give the 412EP a smooth ride capable of lifting over 5,000lbs or carrying up to 13 passengers and a range of 400nm. The Bell 206L Long Ranger is a stretched variant of the venerable Bell 206B with seating for seven or two stretchers and two crewmen. Combining the dependability and safety of the 206B with an additional 30 inches in fuselage length gives the customer even better cargo space while increasing external payload capacity to 2,000lbs and maximum range to over 300nm. The Bell 407 is the evolutionary successor to the Bell 206L Long Ranger. Now equipped with a four-bladed rotor systems with improved performance and better ride comfort, carbon fiber composite tail boom, digital engine management, and an 8 in wider cabin, the 407 offers more cargo space and increased internal and external payload capacity over the Bell 206L as well as significantly improved performance in high altitude/hot weather environments. In ground effect hover ceiling has been increased from 8,200ft to 12,200ft. The Bell 407 is the fastest intermediate light helicopter on the market. It blends reliability, speed, performance, and maneuverability with a cabin configurable for a variety of purposes and payloads. The Learjet 35A fits the light corporate jet category and is known for its relatively long flying range of 2,056 miles nonstop, making it the jet often chosen for private use. The Lear 35A seats 7 passengers comfortably.